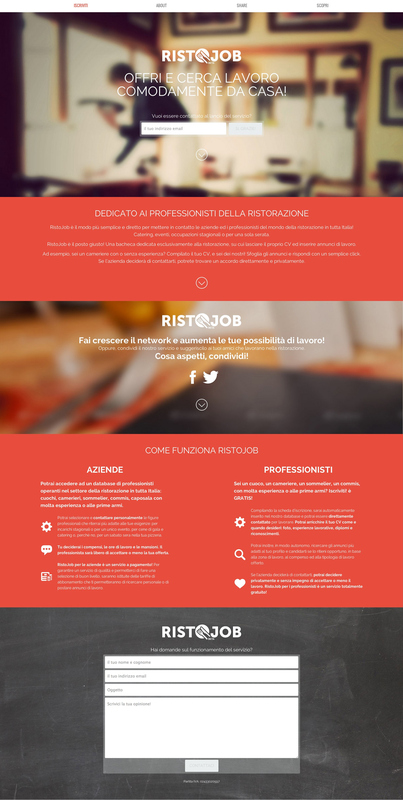 Responsive launching soon page for RistoJob – a job board dedicated exclusively to restaurants in the aim bring together professionals in the Italian food industry. Simple One Pager but has all the necessary info neatly laid out. RistoJob is the most simple and direct way to bring together companies and professionals in the world of food in Italy! Catering, events, seasonal jobs or for one evening. For example, you're a waiter with or without experience? Compiled your CV, and you're one of us! Browse ads and answer with a simple click. If the company decides to contact you, you will find an agreement directly and privately.